I am writing to you on behalf of my brother, Tom Pearson, a young man who lived a very active life prior to a motorcycle accident. On August 25, 2012 Tom sustained a life-changing spinal cord injury. He had broken several bones and was just hanging on to life. He has made it through the most critical stages however the lower half of his body remains paralyzed. 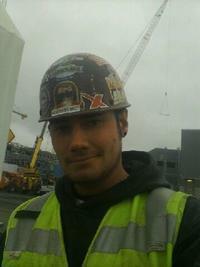 Prior to the accident Tom loved every second of his work walking the “iron in the sky” as an Ironworker. He loved the bond and friendship of the ironworkers’ brotherhood. When not building our nation’s infrastructure he loved to snowboard, fish, ride his motorcycle, play with his adorable dogs, and take his girlfriend on dates to unique places our dad showed us growing up. In his 27 years Tom has acquired such a zest for life, a love and appreciation for every breath, and is always looking forward to the next adventure. Though the accident has definitely got him down, we know it is only temporary. It is not in Tom’s nature to give up; he is a fighter no matter what the obstacle. The challenge now is both physical and financial. Most urgently funds are needed to purchase a wheelchair and make home modifications so it is wheelchair accessible with specialized equipment. He is in need of a modified vehicle to regain some independence with the hope of returning to the work he loves in some capacity. His much needed rehabilitation is necessary for the best possible outcome. To assist with the costs of the van, home modifications and rehab, a fundraising campaign in Tom’s honor has been established with HelpHOPELive (formerly NTAF), a nonprofit organization that has been assisting the transplant community for nearly 30 years. In 2000, they expanded their mission to include those who have sustained a catastrophic injury. All contributions are tax deductible, are held by HelpHOPELive in the Northwest Spinal Cord Injury Fund, and are administered by HelpHOPELive for injury-related expenses only. Please consider making a donation:We will be planning some fundraising events this fall. We could certainly use your time and energy. Please email [email protected] to volunteer. Thank you in advance for any help that you can give!! Hey Tom: We are so proud of you and the amazing progress you have made to date. Keep up the hard work and positive attitude. We will cotribute just as soon as we can. Tom I Wish I could snap my fingers and everything would be fixed and done for you. If I could I would in a heartbeat...for now I will try to be the best possible friend I can and lend you a helping hand when you need it. We luv ya Tom!